It was just a mass of people and we were singing and hugging and kissing and shouting, and I suppose mainly we just couldn’t believe that the war was over. Victory! 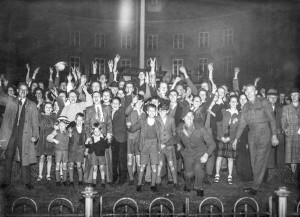 On May 7th 1945 the German military officially surrendered to the Allies. For the American servicemen stationed in East Anglia, victory was a long time coming. Since the D-Day landings in June the previous year, the 8th USAAF had been supporting ground forces advancing across France and Germany and by April 1945 the missions to bomb Germany had become less frequent. With Germany’s impending defeat, the 8th began a new type of operation. Dutch civilians, cut off by flooding and the German army, were close to starvation. 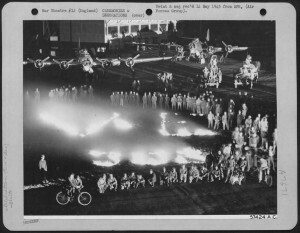 The B-17s of the 8th USAAF began Operation Chow Hound, together with the RAF’s Operation Manna, dropped thousands of tons of food across western Holland to help end the Dutch famine. 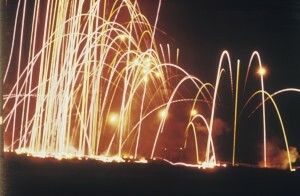 The leaders of the USAAF knew that with the end of hostilities the situation would change rapidly. 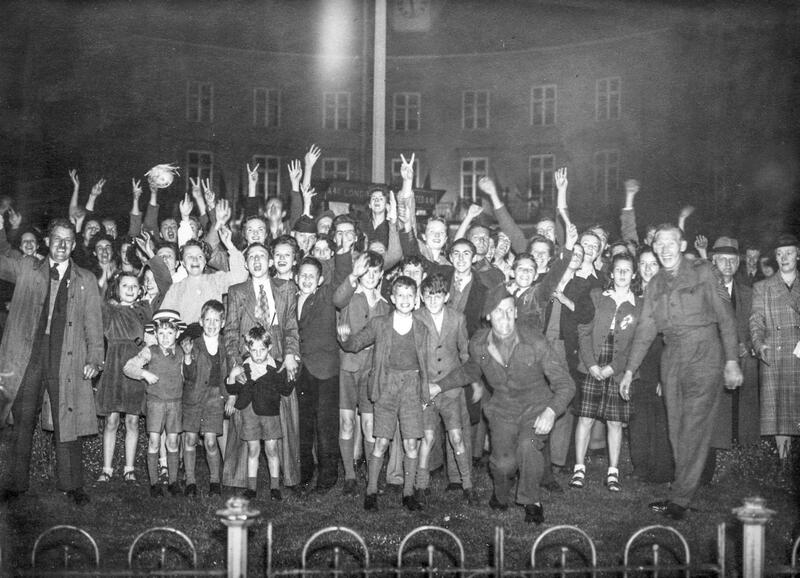 They issued orders to their officers to begin educating the servicemen on how to conduct themselves on VE Day in their host country. 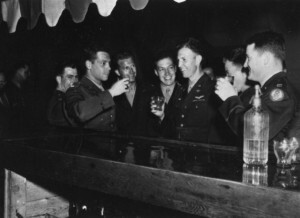 They even encouraged station commanders to investigate providing free beer for the men to keep them on their bases and out of trouble. 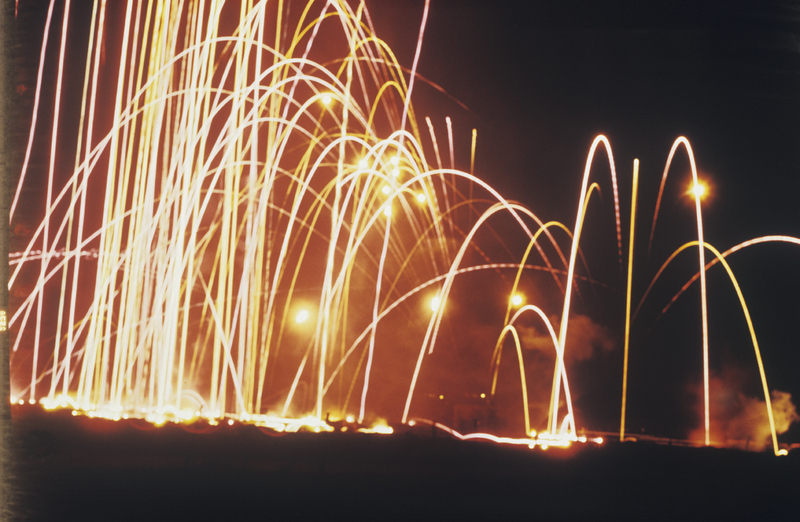 When the day and hour of victory finally arrived, the men who were not already out on leave were restricted to their bases where they celebrated with fireworks. 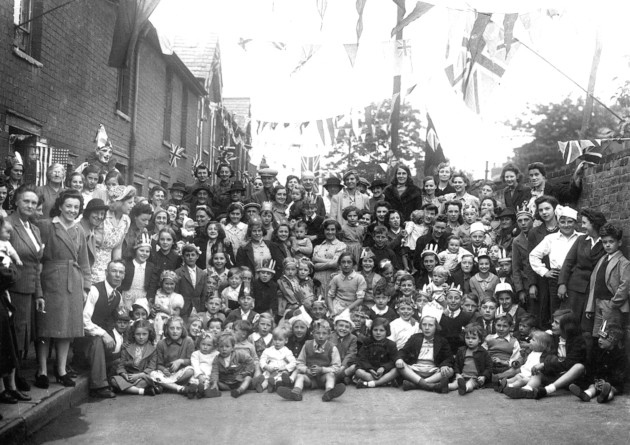 Those already on furlough found themselves in the joyous embrace of the British people in the villages and market squares across the region. “On the VE night, father was exhausted because as well as running his business he got home guard, but he insisted that mother and I walked down to the city centre, to the marketplace in Norwich, and said ‘both of you have got to go because you’ll never see this again in your life and I want you to go’, so we walked from Colman Road, we couldn’t believe it there was the odd street light on and then the houses hadn’t got their black-out curtains drawn, so for me after 6 years of darkness it was quite unbelievable.